The U.S. special envoy for North Korea met with South Korea’s national security adviser on Monday to discuss a planned second summit between President Donald Trump and North Korean leader Kim Jong Un, Seoul’s presidential office said. 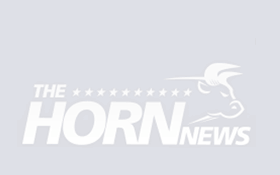 Stephen Biegun explained to Chung Eui-yong Washington’s stance toward North Korea ahead of talks on setting up the summit, the presidential Blue House said in a statement. There is speculation that Biegun will meet his North Korean counterpart at the Korean border village of Panmunjom or in North Korea’s capital, Pyongyang, this week. The Blue House did not specifically say what was discussed during Monday’s meeting, but said Chung told Biegun that South Korea hopes the planning talks between the U.S. and North Korea will pave the way for a successful summit. 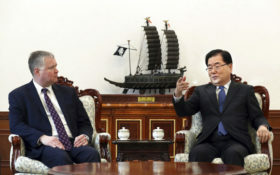 Biegun arrived in Seoul on Sunday and also held talks with South Korean Foreign Ministry official Lee Do-hoon. Trump and Kim met last June in Singapore, where they issued vague aspirational goals for a nuclear-free Korean Peninsula without describing when or how it would occur. Post-summit nuclear negotiations between the United States and North Korea have been rocky, with the countries disagreeing on which should come first — North Korea’s nuclear disarmament or the removal of U.S.-led international sanctions against the North. South Korea didn’t say whether Biegun and South Korean officials discussed the possibility of partially easing the sanctions on North Korea to allow more inter-Korean cooperation and create more space for nuclear diplomacy. South Korean President Moon Jae-in, who held three summits with Kim last year and helped set up the first Trump-Kim meeting, has described inter-Korean reconciliation as crucial for resolving the nuclear standoff. But the tough sanctions have limited the range of joint activities the two Koreas can undertake. Sponsored: CDC Warning: Have you Been Exposed? The Koreas have discussed ambitious plans, such as reconnecting railways and roads across their border, resuming operations at a jointly run factory park in a North Korean border town and restarting South Korean tours to the North’s Diamond Mountain resort. But none is possible unless the sanctions are eased, which Washington says won’t happen unless North Korea takes stronger steps toward irreversibly and verifiably relinquishing its nuclear weapons. In his New Year’s speech last month, Kim urged more cooperation between the Koreas and said the North is ready to reopen the factory park and resume joint tours to the resort. Satellite video taken since the June summit has indicated North Korea is continuing to produce nuclear materials at its weapons factories. U.S. intelligence chiefs told Congress last Tuesday that they believe there is little likelihood Kim will voluntarily give up his nuclear weapons or missiles capable of carrying them. Biegun said last week that Kim committed to “the dismantlement and destruction of North Korea’s plutonium and uranium enrichment facilities” during his summit with Moon in September and at a meeting with U.S. Secretary of State Mike Pompeo in October. At a second Trump-Kim summit, some experts say North Korea is likely to seek to trade the destruction of its main Yongbyon nuclear complex for a U.S. promise to formally declare the end of the 1950-53 Korean War, open a liaison office in Pyongyang and allow the North to resume some lucrative economic projects with South Korea.